This entry was posted in Association on 17 Apr 2019 by Glen Moore. The link below converts your military occupation to a civilian equivalent. Using these tabs you can convert your military occupation to a civilian equivalent National Occupation Code (NOC). Search results will provide a list of NOCs and Civilian Titles. This entry was posted in Association, Veterans Concerns Committee (VCC) on 15 Apr 2019 by Glen Moore. Nominations for the Association executive were held on April 11th. This entry was posted in Association on 15 Apr 2019 by Glen Moore. Come and enjoy an afternoon of movie music in CBC’s iconic Glenn Gould Studio. 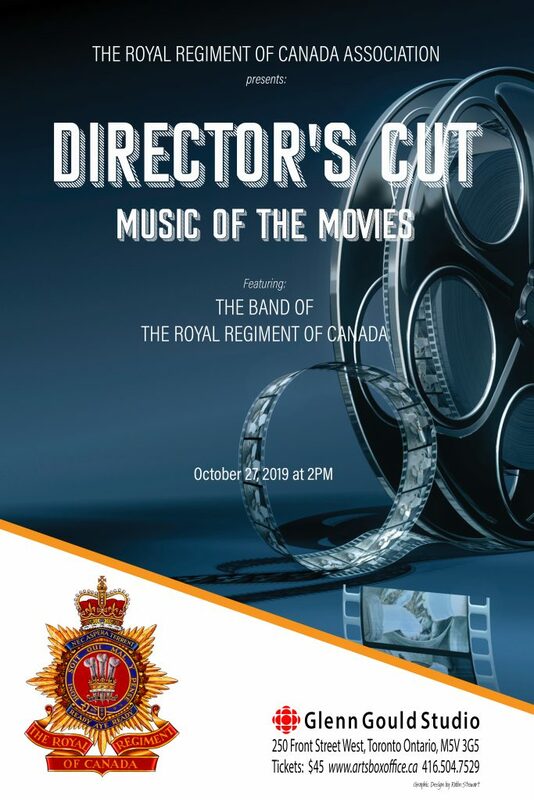 Our Regimental Band’s fourth annual fall concert, Director’s Cut is a showcase of popular music of the movies that spans the generations, from war movie marches to classic Academy Award winners; from Disney and Pixar to today’s blockbusters. Bring your children, grandchildren, parents and grandparents for family entertainment. Music is a shared experience, so come and learn about something about the lives of the other generations. Sing along and tap your toes – the more things change the more they stay the same! Join us for an afternoon of family entertainment with our Regimental Band with vocalists Danielle Bourre and Melina Melle. MC Jacquie Perrin will tie it all together. This entry was posted in Association, Band, Events on 18 Mar 2019 by Glen Moore. This entry was posted in Association, Newsletters on 8 Mar 2019 by Glen Moore. Honorary Colonel of The Royal Regiment of Canada from 1991 to 2006. MGen Lewis served in Palestine with the British Army and joined the Canadian Militia in the 1950s. He was the Commanding Officer of 25 Service Battalion, Commander of Toronto Militia District and Chief of Reserves. MGen Lewis also served as a senior advisor to the Minister of Defence on matters relating to the Reserves. With Sheila at his side, MGen Lewis passed on February 24th, 2019 at Sunny Brook Veterans Hospital. Final services for MGen R. Lewis are now available. Visitation will be on Friday March 8, 2019 from 2:00 – 4:00 pm as well as 6:00 – 8:00 pm. RCMI, 426 University Ave, Toronto, ON M5G 1S9 at 1:00 pm on Saturday, March 9, 2019. This entry was posted in Association on 26 Feb 2019 by Glen Moore. Final arrangements have been confirmed. Hopefully members of the Association that are attending the events on the 10th at Coronation Park can attend the service. It would be greatly appreciated by Mrs Marjorie Beal. At the going down of the sun and in the morning, we will remember you. Stand down, good and faithful servant, and be at peace. This entry was posted in Association, Events on 7 Nov 2018 by Glen Moore. This is a City of Toronto activity supported by the band and a 100 man guard from the Regiment. Guard will be in place by 10:45 AM, so I would suggest everyone who will be in attendance, be over at the park by 10:30 AM. Dress will be full dress with CF medals only, and poppy. Join members of the Canadian Armed Forces and the Commonwealth Consular Corps for a special re-dedication ceremony of Coronation Park. The unique commemorative function of Coronation Park, tied to the First World War, is being restored. A moment of silence will be observed. Coronation Park on the waterfront is a living war memorial that was opened to commemorate King George VI’s coronation on May 12, 1937. The trees in the park commemorate the service and sacrifice of Canada’s military forces, principally those from the Great War (also known as the First World War) and embody the spirit of idealism that emerged following the horrors of the war. 144 trees were planted to commemorate Canada’s military in honour of the King’s coronation. This was the largest tree planting of its kind in Canada at the time. Each tree was ceremonially placed by veterans of the Canadian Expeditionary Force. On August 1, 1938, veterans returned to simultaneously unveil plaques, with one tree to commemorate each unit that fought. During the 1939 royal visit, war veterans and the Men of the Trees and Toronto students planted 123 sugar maples along Remembrance Drive as the royal vehicle passed by. The park is an important commemorative space and is possibly the largest First World War memorial in Toronto. It is now being restored to its original design as a permanent memorial to Canada and Toronto’s war effort. The first stage of this redesign will be completed by November 10, 2018. TTC Information: Take the 511 Bathurst or 509 Harbourfront Streetcar to the Exhibition Loop (Princes’ Gates). Walk out to Strachan then south across Lake Shore Blvd. and into the Park. Alternately take the 29D Dufferin Bus to Exhibition Loop. For those who are driving to the event, Green P parking locations. Note that Green P parking is CLOSED on Remembrance Drive for the event. This entry was posted in Association, Band, Cadets, Events, History on 7 Nov 2018 by Glen Moore. This weekend is a very busy weekend for the Association and the Regiment. The ‘Gala” dinner will commence at 1800 hours with the commemorative plaque unveiling at 1845 hours. Dinner commences at 1900 hours with a guest speaker following. Remembrance Day Parade at St. James Cathedral. Service starts at 1045 hours, with the march past following the service. It will be crowed, the Governors Generals Horse guards will be parading with us. Arrive early to get a seat in the church, or ensure you are on-site by 12:30 to form up for the parade. More details as to timings will be released closer to the date. It looks like they are exercising in Petawawa. The next Association meeting has moved forward to November 29th. The dress for this meeting will be business casual. Since this is our last meeting of the year it will also be a pot luck and as in past years we will be having an ugly Christmas sweater contest. The Association will be taking part in the Regimental all ranks dinner. As previous years the cost for the dinner is $25.00. If you plan to attend please bring your payment to the next Association meeting.